34.29 x 60.96 cm (13 ½” x 24”) © Museum of Fine Arts Boston (MFAB-246). Being a painter who loves to paint landscapes, my inclination when Summer turns into Fall is to show a painting, naturally. And, in my mind, no artists captured Autumn better than the artists of the Hudson River School. I mean, with this painting you can practically smell the crisp northeastern US Autumnal air. 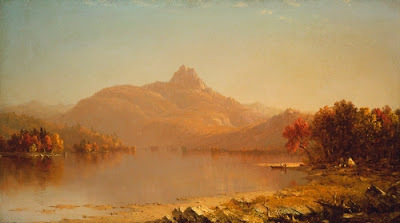 Although the Hudson River School was not actually a “school,” it was composed of a group of artists who were basically paying homage to the vast, beautiful American landscape in the early first half century of this country’s existence. In the third quarter of the 1800s, many of these artists pursued a visual accuity of light and atmosphere that was something of a precursor to Impressionism. The Hudson River School artists did not depict the Northeast landscape with unflinching detail of exactly what they observed. They rearranged elements of the landscape and heightened dramatic elements in their works to achieve a romantic realism. This trend continued with the artists who worked in a branch of the Hudson River School now called Luminism. Luminism was characterized by an accute appreciation for the interaction of light and atmosphere, although, unlike the Impressionists in France, Luminists did not paint outdoors. They made detailed sketches outdoors with notes about nuances of light and color and executed their landscapes in the studio. Sanford Robinson Gifford is my favorite of the artists who worked in the Luminist aesthetic. Born and raised in the Hudson River, he first studied in New York to be a portrait painter. Inspired by the work of Thomas Cole (1801-1848), he turned to landscape painting. The summer of 1846 Gifford spent in the Catskill and Berkshire mountains making sketches. Already by the following year he had begun showing his landscapes at the National Academy of Design in New York City. In 1855 Gifford went to Europe where he spent over two years visiting the great museums and sketching scenery. He was particularly drawn to the paintings of Joseph M.W. Turner, whose handling of color and light he admired. He was also impressed by the French realist Barbizon painters, however felt that they did not follow nature closely enough. When he returned to the US in 1857, he set up a studio in New York but made frequent summer trips to the Catskills, Adirondacks, Green Mountains, White Mountains, and Maine and Nova Scotia. Gifford’s early work reflected the somewhat dry, early works of Cole. He rapidly moved in a different direction during the 1850s. By 1855 he had discovered his own style in typically small, minutely detailed atmospheric views of mountains, stretches of shimmering water, and glowing sunsets. An October Afternoon is typical of Gifford’s mature style. In his keen interest in capturing accurately observed light and atmosphere, Gifford is closer in spirit to Asher B. Durand (1796-1886) rather than Cole in attention to natural detail, although Durand may have considered Gifford’s shimmering light effects too mannered. Gifford called his works “air paintings.” In order to achieve glowing atmospheric effects, he varnished each finished painting with numerous layers of semi-transparent oil, that created a type of veil between the painting and the spectator’s eye. Studio activity: Paint an autumnal tree. Using tempera paints and an 11 x 8 ½” piece of thick paper, paint a single tree in the colors of Autumn. Remember that warm colors (such as red, yellow and orange) seem to advance while cool colors (such as blue, green and purple) recede. Cool colors can be used for deep shadows and the distant background, while the warm colors can help create a light-struck, sunny compposition.